This past July, I enjoyed a wonderful Japanese dinner at Ani, a neighborhood spot in Lakeview (aka my 'hood!). 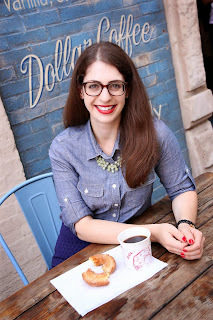 I loved the menu, ambiance, and chef so I was excited when I had the chance to come back to experience an entirely different menu. Every Monday evening, Ani offers an izakaya menu. If you're not familiar, an Izakaya is a casual Japanese drinking establishment that typically offers small plates of food to accompany drinks. These are places typically frequented after work. Ani's izakaya menu offers a rotating selection of dishes crafted by sous chef Clayton Weber. 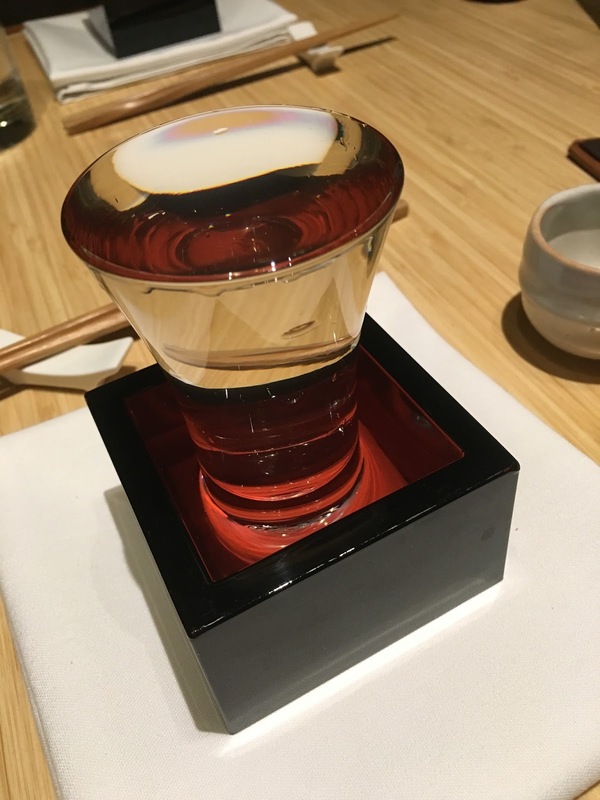 As a welcoming gesture, you're served a glass of house sake which overflows into the box beneath. I had this the last time I was in and loved the unique gesture of prosperity, welcoming, and generosity. I had the pleasure of experiencing the izakaya menu with other Chicago foodies and bloggers which allowed us to try an abundance of dishes. The menu is quite large, with dishes ranging in size. We tried 10 dishes from start to finish, which sounds like a lot, but I actually left feeling comfortably full. First, was edamame hummus served with salmon skin chips. The chips were an interesting touch, but they provided a nice crunchy contrast to the creamy hummus. The hummus was topped with pickled fresno chilis, fried garlic, and scallion. I love the Brussels sprouts at Ani, so I'm glad we got them. Ani makes theirs with togarashi (Japanese spice mixture), garlic chips, yuzu, nikiri (sweet soy sauce), and bonito flakes on top. They are ultra crispy and have wonderful flavor. Next up were the chicken tail skewers with sansho (Japanese pepper), yuzu oil, and scallion. These were nicely grilled and had a juicy and tender texture. One of the most flavorful dishes was the fried chicken. It had a spicy and tangy sauce that was amplified with the accompanying lime. One of my favorite dishes of the evening was the fried mushroom caps. These fried shiitake and king oyster mushrooms were battered in tempura and served with radish and a wasabi aioli. They reminded me of the fried mushrooms I ate growing up, but these were WAY better. 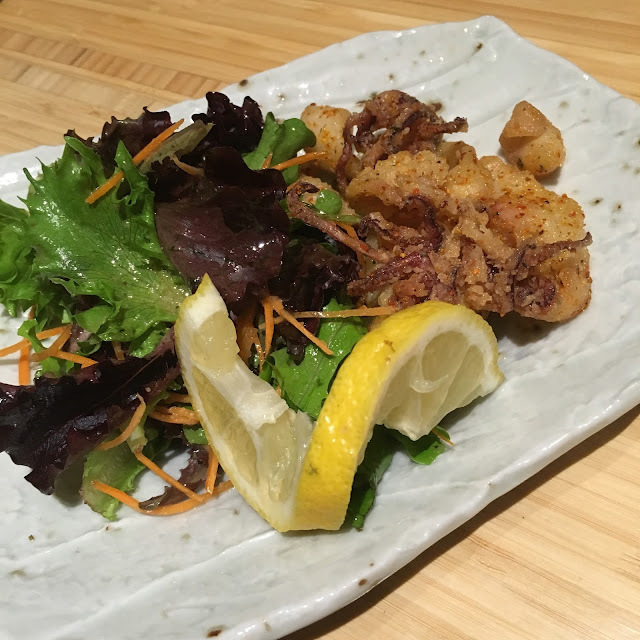 Continuing with the fried motif, we enjoyed the fried ika (squid) with togarashi, lemon, and mixed greens tossed in a plum wine vinaigrette. It was spicy, crispy, and nicely balanced with the lemon and mixed greens on the side. The izakaya menu includes some robata (grilled) items including sweet potato, squash, and pork. We tried the sweet potato with miso honey butter, crispy sweet potato threads, and scallion. The flavors were a match made in heaven. I loved how something so simple could taste so delicious. Our last two savory dishes were more substantial. The first was the char sui bao, or breaded, fried pork bao, served with a poached quail egg, yuzu, and napa slaw. I loved picking up the bao and seeing the quail egg ooze out. It added a nice creamy texture to the crispy pork. 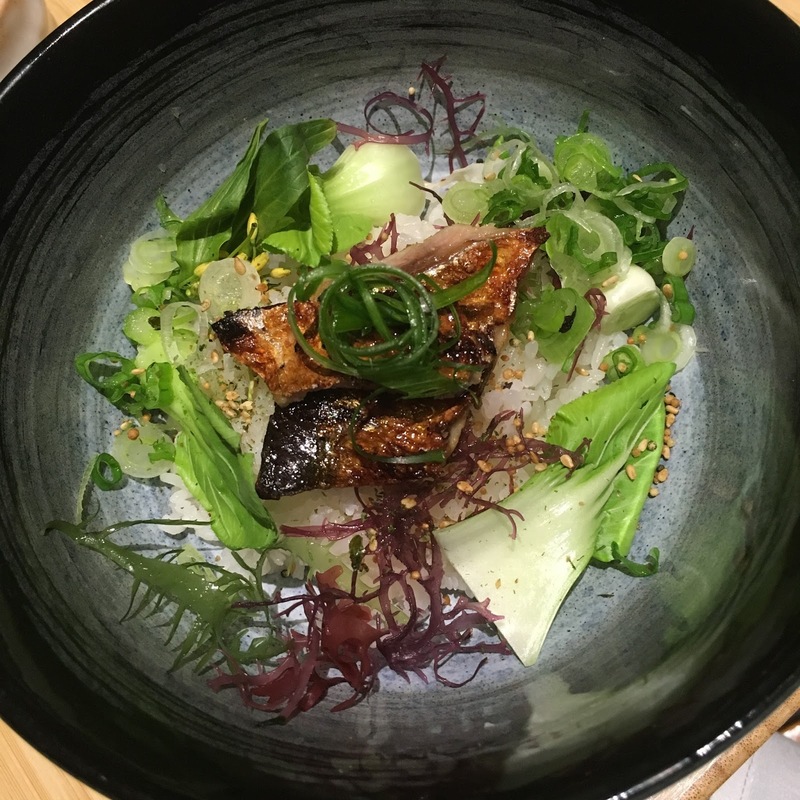 Our last savory dish was actually a miso soup consisting of a piece of charred sanma (mackerel pike), furikake (Japanese seasoning), kaiso seaweed, yu choy blossoms, and baby bok choy. First of all, the presentation was beautiful. Secondly, this soup had so many flavors and textures. The fish was crispy, the soup was smooth, and the rice added another layer of texture. Sanma is definitely a fishy fish, but it really added depth of flavor. I also enjoyed the bok choy and yu choy blossoms which added some crunch and balance. The soup was served with all ingredients in the bowl, and then the broth was poured tableside. Lastly, we enjoyed a sesame cake with smoked vanilla and matcha ice cream, yuzu caramel, and cranberry relish. The savory cake was delicious with the outstanding yuzu caramel. I could eat that caramel all day everyday! If you're interested in checking out Ani's izakaya menu, it's offered each Monday evening. The menu is constantly rotating so you're sure to have a unique experience! Note: my meal at Ani was complimentary; however, all opinions are my own.